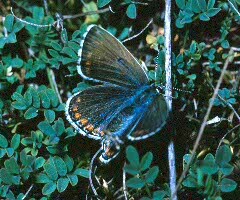 Adonis Blue requires short-turf unimproved grassland with Horseshoe Vetch (Hippocrepis comosa). 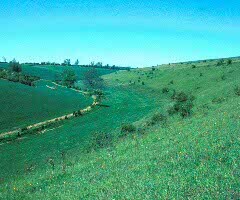 On steep slopes, level tracks made by grazing stock can provide suitably hot conditions even if the sward between the tracks is mostly too high. 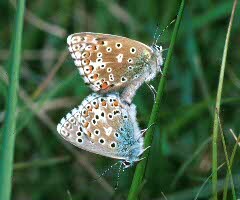 The Chalk-hill Blue is found on similar sites and uses the same larval foodplant, but it is more tolerant of longer turf. 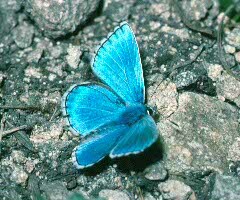 A suitable site for Adonis Blue will almost certainly have a Chalk-hill Blue colony. the species is not present there. Adonis Blue died out in the Cotswolds and declined elsewhere in southern England when myxomatosis in rabbits reduced their populations, and many unimproved grasslands were left ungrazed. It is unlikely that there will be natural recolonisation of sites that are suitable now, so two reintroductions to Cotswold sites were carried out by Butterfly Conservation in the early 1990s. The colonies lasted for a few years only, unfortunately. On one of the sites most of the Horseshoe Vetch plants died one year, and on the other site the turf was mostly too long to support a colony in the long term. This is one of the popular species for which there are sometimes "unofficial" introductions. It seems likely that this is the cause of specimens seen in a few other places in recent years, and a small colony may still survive on one site as a result. From about mid May to late June for the first generation, mid August to late September for the second.